Jackson State University’s Center for University-Based Development has launched a campaign to bridge the JSU family with the local community. Residents, churches, and businesses surrounding Jackson State University’s main campus may now receive real-time news through text alerts, by opting into a text-based messaging system. This will allow information to flow directly to your cell phone. Residents living within a one-mile radius of campus – text JSURESIDENTS (one word) to 95577. 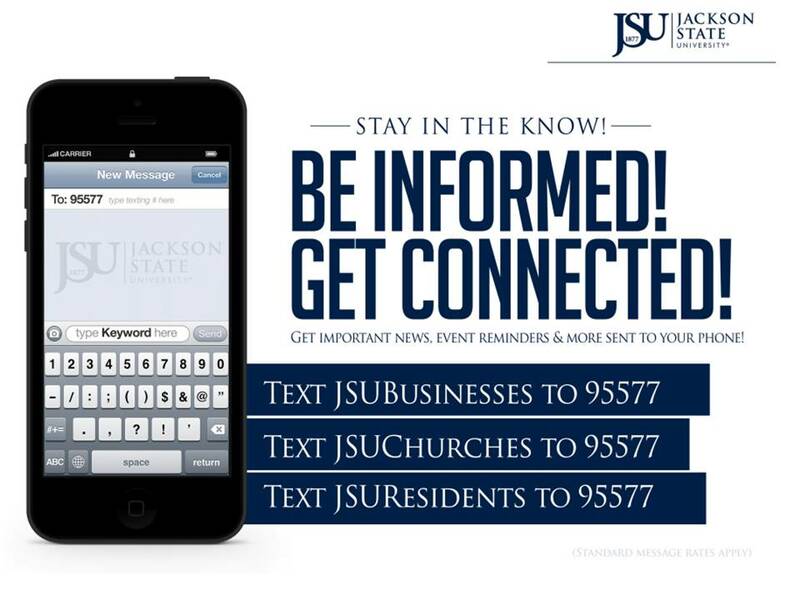 Churches located within a one-mile radius of campus – text JSUCHURCHES (one word) to 95577. Businesses within a one-mile radius of campus may – text JSUBUSINESSES (one word) to 95577. Each group will receive periodic text alerts from JSU with information about events, opportunities or other news that may be of interest to them. Jackson State University looks forward to communicating directly with its neighboring residents, businesses and congregations. Now, pick up your phone and text! For more information call 601-979-5828. Also, today is the last day of school for kids and if you are looking for a place for your children this summer, think about JSU. Check out the video to find out more about JSU Summer Camps, because many begin on Tuesday!